An asteroid considered “potentially hazardous” by NASA, about half the size of the one that allegedly wiped out the dinosaurs, is expected to skim the Earth’s atmosphere about a week before Christmas. Named Phaethon after the Greek god who nearly destroyed the world, the giant rock careening through space is “a potentially hazardous asteroid whose path misses Earth’s orbit by only two million miles”, says NASA. “It measures 5 km wide, about half the size of the asteroid or comet that wiped out the dinosaurs 65 million years ago,” writes Dr. Tony Phillips, production editor of NASA Science. For NASA to classify a space rock as “hazardous”, it must not only have the potential to make close approaches to Earth, but cause serious damage in the event of impact. A meteor that didn’t make landfall but merely exploded in the atmosphere 18.6 miles (30 km) above Russia’s Chelyabinsk region in 2013, caused over 1,000 injuries and extensive damage to property, reports NTD. The force of the explosion of the Chelyabinsk meteor is said to have been about 400 – 600 kilotonnes of TNT, so about 30 times greater than Little Boy, the atomic bomb dropped on Hiroshima, according to National Geographic. Hubert Foy of Space Safety Magazine estimates that if a meteor the size of the Chelyabinsk one were to strike a populated city, the devastation would be horrific. Russian astronomers are keeping a close eye on Phaethon’s orbit. Scientists from the Immanuel Kant Baltic Federal University have published a video which tracks the asteroid’s travel path. NASA also monitors objects that could come perilously close to Earth through its Near Earth Object Program. New PHAs are being discovered every month and still, there are tens of thousands of uncharted PHAs of significant size, according to the Large Synoptic Survey Telescope (LSST) project. Best estimates are that there are 10,000 to 20,000 PHAs larger than 100 m (328 feet). But Phaethon is also noteworthy for the unsolved mystery around what it actually is. According to NASA, it’s technically defined as an asteroid, in fact the first ever to be discovered by satellite. But it’s also the parent object that produced a unique meteor shower called the Geminids, something asteroids are incapable of producing. Other theories say that it’s a dead comet, or a rock comet. “So what it comes down to is that the Geminid parent object is a mystery,” says NASA’s Marshall Space Flight Center’s fact sheet. 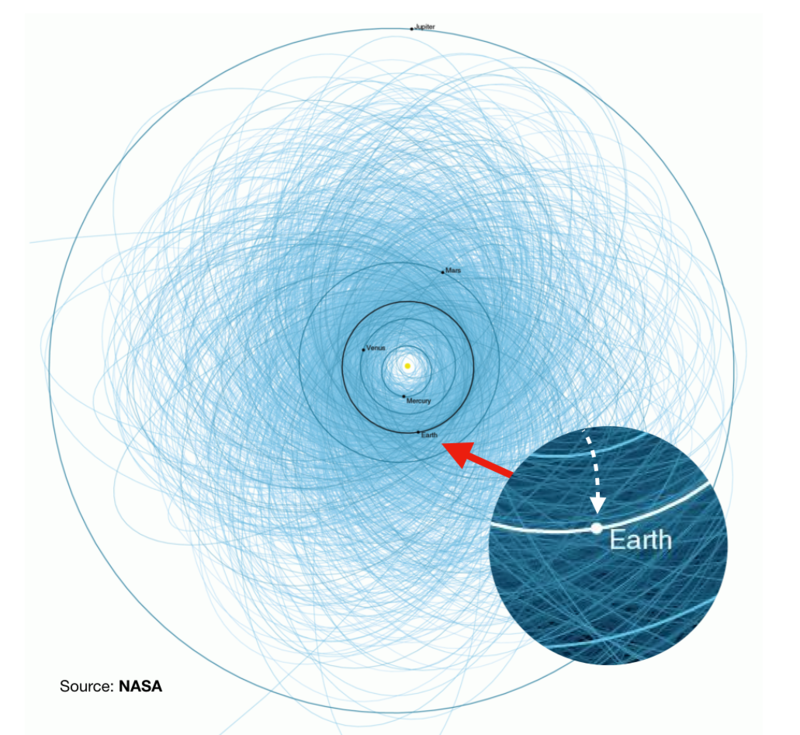 Whatever Phaethon is, NASA says it will pass a safe distance away from Earth. 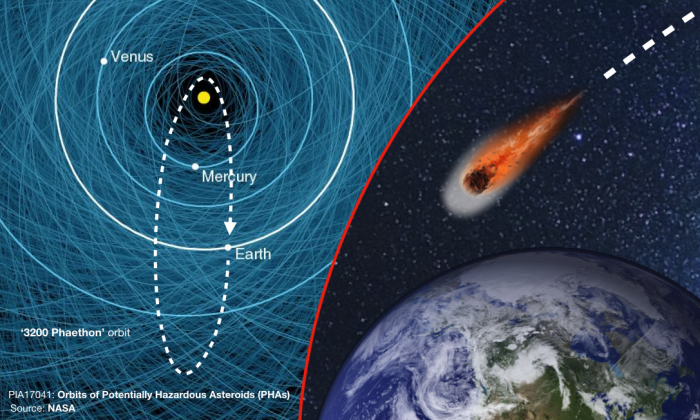 In fact, the agency is quick to point out that none of the PHAs on NASA’s threat watch list, called the Sentry Risk Chart, are currently worrisome, according to NASA’s Jet Propulsion Laboratory. But that assurance may not be much consolation, says Alex Filippenko, astrophysicist and professor of astronomy at the University of California, Berkeley, in an interview with Discovery (see video below). We have a small favor to ask of you. More people are reading The Epoch Times than ever, but ad revenues are declining across the industry. If you can, please share this article on Facebook. It takes less than a minute. Thank you very much!